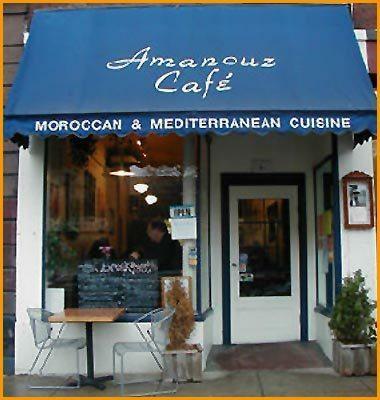 After reading all about the traditional cuisine and sweet mint tea of Morocco I was more than ready to experience it myself when I headed to Amanouz Café in Northampton, Massachusetts. Located on Main Street this unassuming café specializes in the mouth-watering aromas and sumptuous tastes of Moroccan cuisine transporting it from the North African Sahara to this small New England town. As I made my way to Amanouz Café on a sunny March afternoon I started wondering if I would be able to find anything on the menu that I would actually be able to eat. As a non meat-eater I have found myself in many situations at restaurants where I am forced to nibble on a few lettuce leaves or find myself, once again, ordering the tuna melt because every other option on the menu is loaded with meat. Having read up on Moroccan cuisine I knew that many of the dishes were stews that focused on meats such as chicken or beef and that lamb was often the king of the Moroccan table. Needless to say, Amanouz Café was not about to disappoint me and I walked away from my lunch incredibly full and tremendously satisfied. To my surprise, and delight, the menu at Amanouz Café was full of vegetarian options and vegetarian versions of classic Moroccan meals. What I didn’t realize is that meat is often a specialty item, especially for Moroccan peasants, and so many dishes featured vegetables and couscous with fish rather than meat. Fresh vegetables, herbs, breads, fish, couscous, and olives are main staples in Moroccan cuisine which means that as a vegetarian I still get to enjoy the traditional, and delicious, Moroccan meals. The tea came served in a traditional metal tea pot with a water glass that had fresh mint leaves at the bottom. The sweet minty flavor of the tea was absolutely delicious and made me understand the reason for its popularity in Morocco. The Sardine salad came next, lettuce, tomatoes, olives, a hard boiled egg and peppers topped with a Moroccan salsa, fresh sardine fillets, and sprinkled with fresh cilantro. Delicious, fresh, and simple, the perfect start to my Moroccan meal. Next came the Amanouz pizza, a Moroccan twist on an Italian classic. This individual sized pizza, made on Moroccan pita bread rather than pizza crust, had an ingenious assortment of roasted peppers, Swiss cheese, tomatoes, onions, and olives; needless to say it wasn’t left sitting on the plate for very long! The soup of the day at Amanouz Café was traditional Moroccan Lentil soup. A thick, dark, and rich soup chock full of tender lentils and finished off with a swirl of olive oil. The soup made a surprisingly delicious, and extremely filling, contribution to the meal. To my delight I found that not all tagine dishes in Moroccan cuisine focused on meat, this tagine was a stew that consisted of rice, tomatoes, grilled green peppers, and finished with large balls of fish meat on the top. The fish balls were topped with slices of fresh lemon, grated carrots, and fresh parsley and cilantro. It was presented in a traditional tagine by the server who ceremoniously took off the top of the dish allowing the amazing aromas to waft out. To accompany the tagine I had a side order of traditional Moroccan couscous. The couscous was light and fluffy and seasoned with just enough salt and pepper and finished off with a sprinkling of parsley. It made a great addition to the fish tagine but was also delicious enough to eat on its own. It is quite obvious why Moroccans serve couscous at every meal, as a versatile and delicious dish couscous can make a great addition to any meal or be a meal by itself. My vegetarian Moroccan adventure came to a close with more Moroccan mint tea and a few nibbles of the delicious sweet pastries from the counter. Extremely full and more than satisfied by my delicious lunch I walked away from Amanouz Café that afternoon already planning what to order during my next visit. With so many delicious vegetarian options I was happy to know that I could enjoy traditional Moroccan cuisine in such a wonderful atmosphere so close to home. 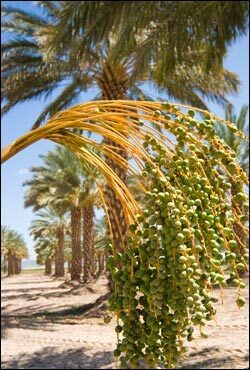 For years producers have been lured to Morocco’s captivating culture, magnificence and diversity. It has been praised for its varied terrain of winding streets, Mediterranean coastal towns, lush river valleys, snow capped peaks, sandy deserts and imperial cities. Morocco’s moderate and rather dry climate has contributed to the sets of many well acclaimed films. Since 1987 more than 500 motion pictures have been produced in Morocco including, movies, television shows, commercials, and documentaries. 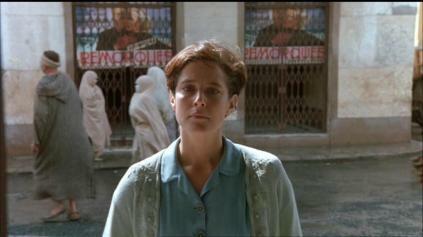 A variety of different directors have flooded Morocco. 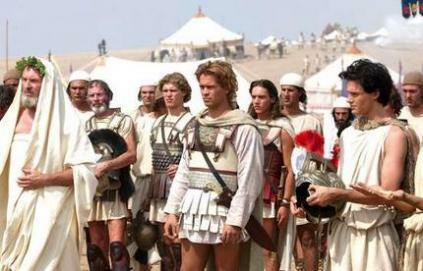 Ridley Scott, who is know for his keen eye and stylish detail has ventured to the Sahara heat for a number of his recent films including Black Hawke Down, Gladiator, Kingdom of Heaven and Body of Lies. 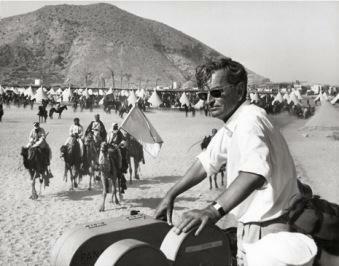 Other names like Breck Eisner, Gillies Mackinnon, Robert Aldrich, Henry Hathaway, Alfred Hitchcock, Orson Welles, John Hutson, Michael Douglas and David Lean producer of Oscar-winning epic tale Lawrence of Arabia have found Morocco to be well fit for their stage. Films are produced all throughout the 37 provinces of Morocco, in a wide range of cities. Babel was filmed in Casablanca, but surprisingly enough the film Casablanca was filmed entirely in Hollywood. 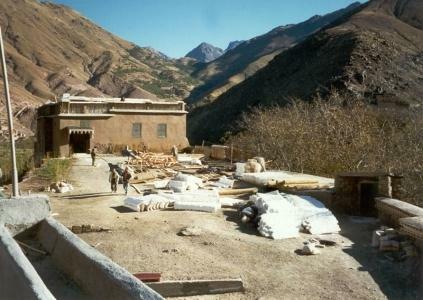 Aït Benhaddou is a hot spot for filming. Five of the Top 15 films were filmed in the rustic sandstone city including: Sodom and Gomorrah, The Sheltering Sky, Jesus of Nazareth, Lawrence of Arabian and Kundun. Among other cities Agadir, Cassablanca, Erfoud, Essauiora, Fes, Meknes, Volubilis, Marrakech, Rabat, Rif and The Atlas Mountains are the most filmed. Not only does Morocco serve as a host to a plethora of widely acclaimed films, it also has a booming industry of its own. 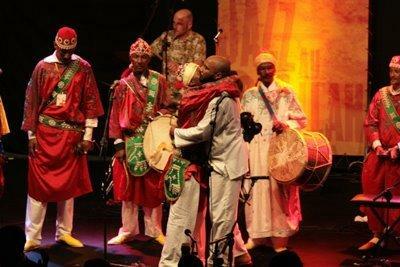 Three of Morocco’s current films are shining limelight in the Pan African Film and Television Festival. Since 2000 Marrakech has held the international acclaim for motion pictures, the Moroccan Film Festival. The festivals hosted by Prince Moulay Rachid and it is one of the biggest events dedicated to film in Morocco. Also in Morocco is the Atlas Film Studio is also a home to a variety of different sets a major tourist attraction for movie buffs. Shopping in Morocco is a unique and exciting experience. No visit to Morocco would be complete without exploring the medinas (walled cities with maze-like streets) of Marrakesh, Fès and Essaouira. Unlike shopping in the West, where people tend to visit local retailers, in Morocco shopping involves visiting the old medina, and touring the various souks and marketplaces. 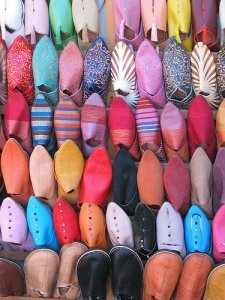 In the souks of Morocco, travelers will find ranging from traditional Moroccan clothing, fabrics, baboosh (shoes), Moroccan cuisine, and Berber carpets. Since most foreign currencies are strong in comparison to the Moroccan dirham, you can go on an extensive shopping spree and purchase various local Moroccan handicrafts such as Moroccan leather work, Berber carpets, silver jewelry, gold and copper along with ancient Fes embroideries and basketwork. 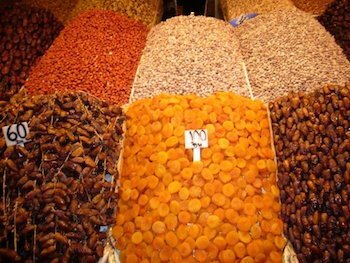 Souks and markets are a major feature in Moroccan life and one of Morocco’s greatest attractions. 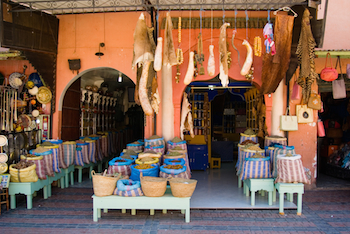 Each major city and town in Morocco has a special souk quarter. Villages in the country side also have local souks which are usually held one day each week in an open field or outside the towns kasbah walls. Large cities like Marrakech and Fès have labyrinths of individual souks (each filling a street or square that is devoted tone particular craft). The cities of Marrakesh, Fès and Essaouira are famous for their beautiful souks which serve as Morocco’s posh and huge shopping centers. Some of the best buys in Morocco are dates, leather ware, handicrafts, Berber carpets, pottery, wood carvings, traditional dress (djellabas) and various food products. Souks and markets are also a daily destination where locals shop for fresh meat, vegetables, household goods and other items that Americans for example, purchase at Whole Foods, Trader Joes, Wal-Mart or Target. In the country side of Morocco, you can find large numbers of weekly souks (markets). A new alternative to souks in Morocco is Marjane, a Moroccan hypermarket chain, found in large cities like Marrakesh, Casablanca, Agadir, Fès, Tétouan and Tangier . Marjane is the “Moroccan Target” and sells a wide variety of items such as food, clothing, liquor, electronics and other household goods. Whether or not you are a big shopper, visiting a souk is a cultural experience that should not be missed on a trip to Morocco. 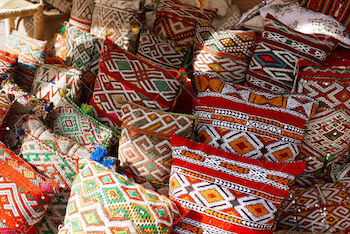 For more information about Shopping in the Souks and Markets of Morocco. Akin to Spain, bread in Morocco is a key component of any Moroccan diet. There is an ancient proverb, “manage with bread and butter until God sends honey”. This ancient saying affirms that there is availability of bread to all groups in Morocco. For example, the Berbers of the Rif Mountains sustained themselves with bread made from Barely. While present times afford more variety in Moroccan’s diets and bread can be supplemented with potatoes, tomatoes, pepper, fruit or nuts, bread still plays an important role in the lives of Moroccans. In cities, Moroccans can be spotted daily in the early parts of the morning carrying bags of assorted breads that they picked up at the market. In villages women can be found baking bread from scratch in earthen ovens. 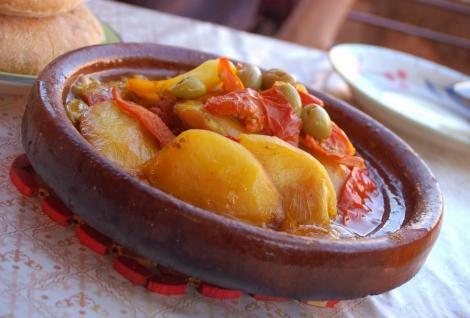 Traditionally, Moroccans eat three meals a day, with lunchtime remaining the most important as all family members still come home from school or work to eat together.At each of these meals, one person is designated to distribute the bread. 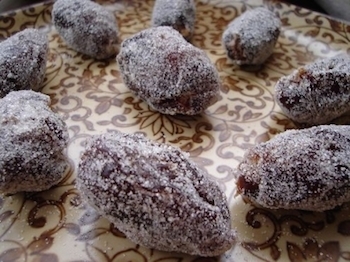 Historically, bread has played such an important role in the life of Moroccans. Until the 1980’s, almost all Moroccan families made their own bread. The Moroccan child wearing a padded hat would walk to the Fran, carrying a gssa or a red pan filled with yeast on top of their heads. Frans, strategically located community ovens, were found in every neighborhood, and baked dozens of loafs at once. These Frans can still be found and are utilized by the Fassis (local people) in the old Medina of Fes. As there were so many breads baking together, anything placed in the oven was marked with a rubber stamp. Today, a faster paced lifestyle in Morocco and an increasing number of households having two working parents has resulted in less use of the Fran. Regardless, if you find yourself being one of the lucky visitors to receive a dinner invitation from a native Moroccan, rest assured that the bread you try will be delicious. Enter any souk during the morning (a Moroccan shopping street in the medina) and you will surely feel a longing to come face to face with the mouthwatering aromas traveling through the air and playing flirtatiously with your sense of smell. Upon entering a bakery, you will be confronted with many choices of breads usually made from coarse barely, flour, wheat, sorghum, or millet. The bread bakers are usually women who are expert in kneading the dough until it is evenly distributed and enriched with herbs, spices, proteins, and other goodies. The breads come in many shapes, sizes, and forms. Some are leavened and others are flat and thin, being shaped into long and crispy donuts or Therfist -unleavened bread in sheets. The most common breads are heavy, spicy, soft crusted and highly absorbent as they are meant to be dipped into a Tajine or Tagine, a traditional stew or sauce. Examples of such breads include Tagella, a special bread made by the Tuaregs of the Sahara or ‘Blue people’. The bread is baked on hot sand. Also popular is Khboz Milka-a flattened circular dough cooked until brown on both sides. If you would like to enjoy an everyday bread, try your hand at Batbout. This tasty bread, best described as a soft chewy bagel or a thick pita, is eaten everyday expect during Ramadan. 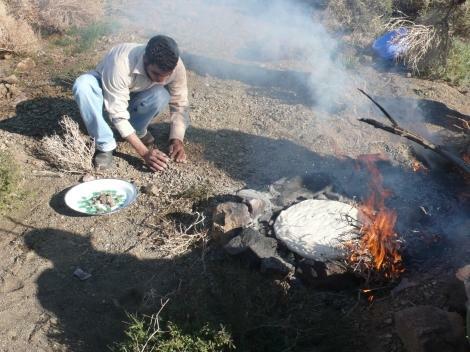 Some of the most exotic bread making experiences can be found in Morrocco’s Middle Atas Mountains with Berber families. There is an ancient tradition of bread baking on rocks that dates back centuries and is still common among Berber families today. The process begins with the kneading of dough until it is brick-thick and then stuffing it with fresh herbs, fat, spices and chilies. Once the bread has been stuffed, it is placed on a round, short stack of rocks that have been heated evenly by brush fire. The bread is then covered with brush which is burned. Within 20 minutes after it is completely cooked, the brush is cleared off. The bread is then cooled with a whisk and served amidst mountain views and clear skies. This type of thick and wonderfully hearty dish – Berber Mountain bread- is akin to the taste of stuffed pizza. The bread is traditionally made by those Berbers of the Middle and High Atlas, who still retain a Nomadic lifestyle. For those who want to participate in this unique bread making experience it can be included as part of a tour in Southern Morocco whereby one discovers ancient Kasbahs, the Draaa Valley and life in a Berber village through Travel Exploration. Walking through the chaotic souks of Marrakesh you will find stall upon stall of beautiful Moroccan ceramics of all shapes and sizes. From large round plates with bright orange flowers to traditional tagines of cobalt blue, the intricate designs and astonishing colors make it hard to believe that most of the pieces were made by hand in a town called Safi. Safi is the pottery capital of Morocco. This quiet coastal town has a diversified industry known for its sardines and seafood as well as its ceramics. While it is an industrial town don’t let that discourage you from visiting, it still boasts beautiful architecture, most of which are remnants of the Portuguese occupation including the old medina and Portuguese Citadel – or Kechla. There is also the potter’s quarter which is home to all of the potters’ workshop and is a popular destination for tourists. Despite Safi being an industrial town life goes on as it has for centuries for the potters in the old potter’s quarter. Safi boasts the oldest pottery kilns in Morocco and the potters there are famous for their plates and tagines with turquoise, white and cream-colored backgrounds and also for the famous green tiles that can be seen on roofs in all the major cities. All of their pieces are still made by hand and are a major source of income for the town of Safi. Row upon row of potters’ workshops can be found displaying their breathtaking works of art and tourists are welcome to watch the potters at work as they create their masterpieces. Pottery and ceramics have always been produced and used in Morocco. In early Morocco unglazed earthen pots were used to store food and water and were key to survival. Glazed and painted ceramics however, were always made to be decorative and only sometimes useful. As imports of fine china became more common Moroccan pottery became more decorative which allowed for potters to create more elaborate designs on their pieces. Pottery-making is truly an art form and Safi pottery is appreciated for its intricate paintings and beautiful colors and can be found in homes world-wide. 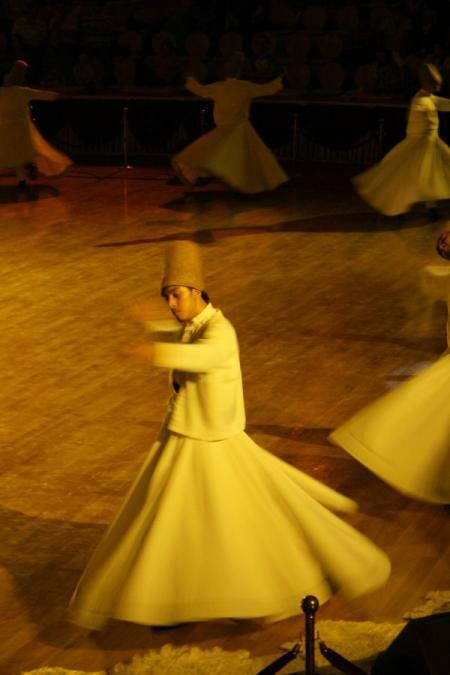 You are currently browsing the Travel-Exploration Blog blog archives for March, 2009.